Mythical cave of treasures is always guarded by indescribable horror. But even menacing monsters get tired of lying on the ground, alone in the darkness. And it happens, that scary dragon sticks head out of his lair and flies away somewhere. 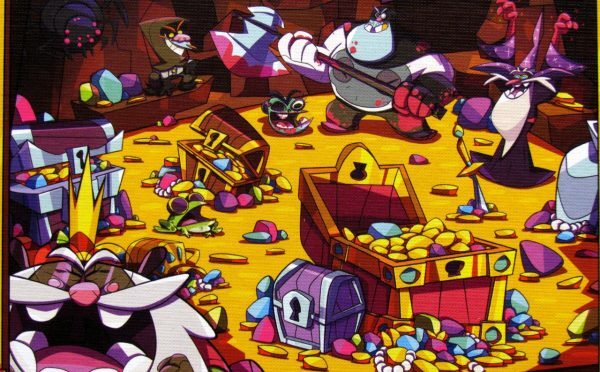 As if they waited for this moment for their entire lives, heroes of the nearby taverns rushed inside and began to loot gold and diamonds! But the dragon will soon return. Quickly! Stuff your pockets and run! Eager heroes have been given an unprecedented opportunity to get rich. It was created by a pair of authors Fel Barros and Marco Portugal, who lured the dragon away. This is a new hot game for 2016, which was released in production of Cool Mini or Not company. The whole box then got final form from Ivan Freire. Small box with golden feel offers prospect of sudden wealth. But heroes are all hungry for riches, they will do anything for it. Even turn back on their friends, with whom they were drinking beer a moment ago. 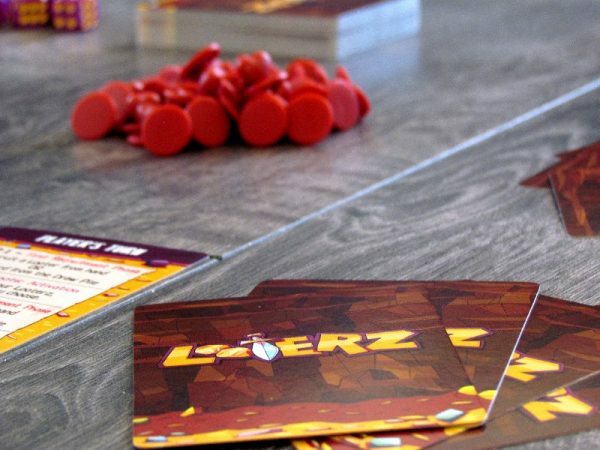 Basis of the whole deck of cards is sixty title looterz, that have values of life and the strength of their attack in the upper corners and some ability in the bottom. Mandatory equipment also includes heart tokens (lives) and treasures (coins). 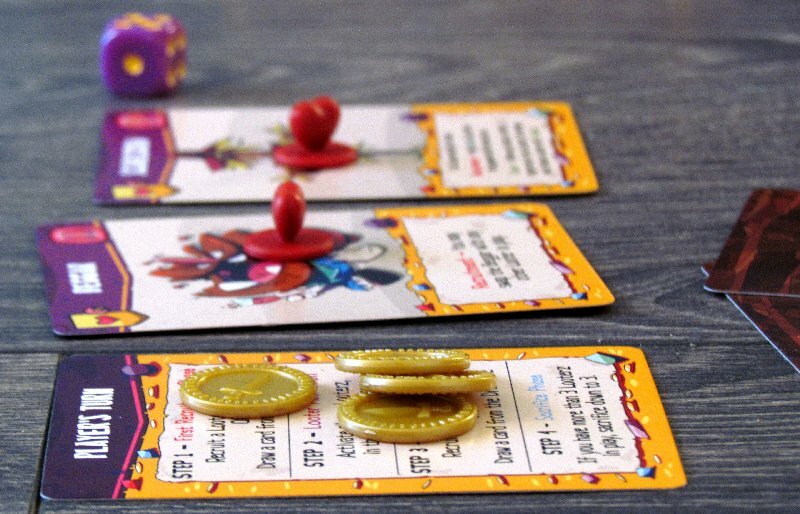 At the beginning of the game, each participant receives a starting set of robbers. 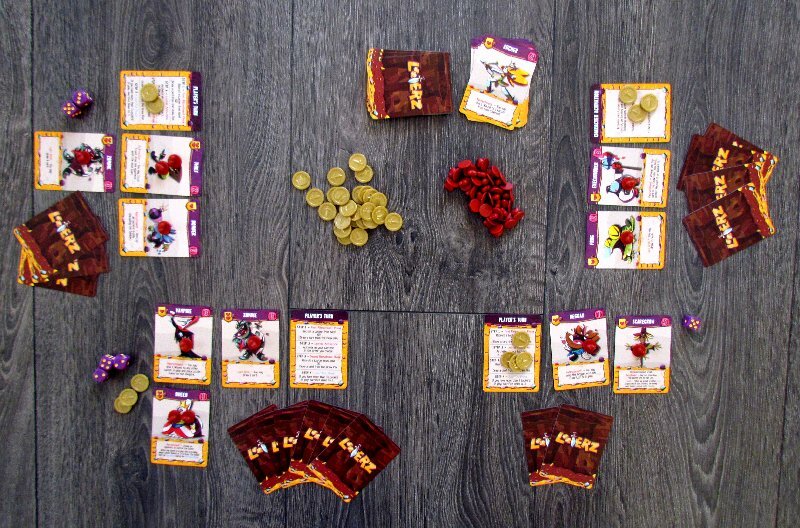 On the table, players put shuffled deck of remaining heroes waiting for their opportunity to steal some gold, together with piles of hearts and coins. In his turn, player has first chance to draw a new hero card or play one from his hand in front of him. 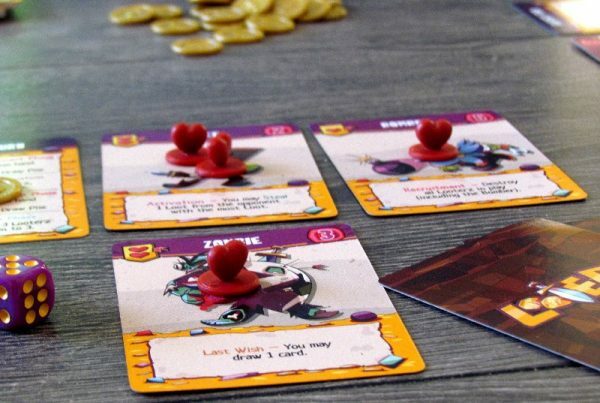 This newcomer immediately gets hearts corresponding to his number of lives. Then it’s time to start exploring the cave and search for treasures. Player at this moment has again selection of three actions. First is exactly, why every prospector has arrived to the cave – they will explore every nook and corner and search for gold! To do this, players get help from dice, which are rolled (number based on lives he has left) and compare results against their strength. Each dice of value less than or equal counts as a found treasure and reward of one coin for owner of hero with it. Instead of doing this, hero can turn against his opponents and attack them . 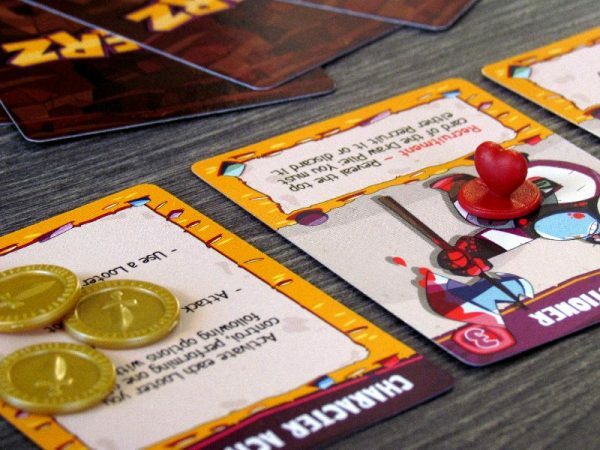 Player chooses a target for his sword (axe, bow or some other crazy weapon), rolls the dice and counts hits (number less than or equal to strength of contested hero). Each successful strike omits one heart token. At the moment, when hero loses his last heart, his card is out of the game. The player then at the end of his turn gets second chance to add new heroes to his active search party. 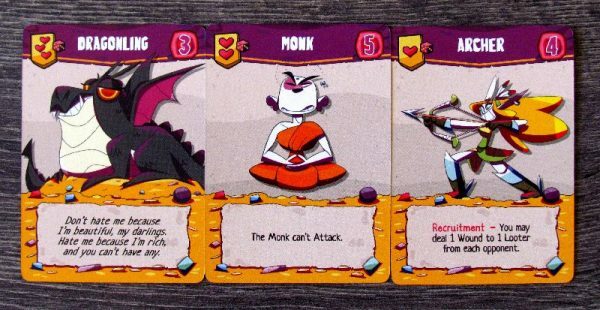 At the end of the round, he also must comply with maximum limit of three heroes in the cave and ten cards in his hand. Game continues with visit of one hero after another. Some leave, others come, but they all contribute coins in pockets of players. And immediately, when someone reaches a predetermined number of coins (depending on number of participants), game ends with his victory. 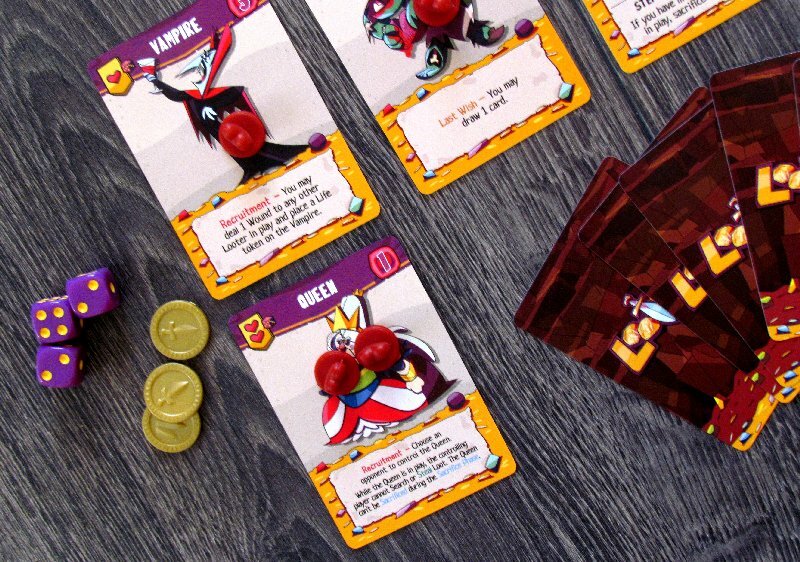 Looterz is exciting card game, in which not only dragon is breathing on your neck (which actually in fact never returns to his lair during gameplay), but above all your adversaries. They have plenty of opportunities to successfully hurt opposing heroes and make winning harder each other. Game itself is purely coincidental and relaxing. 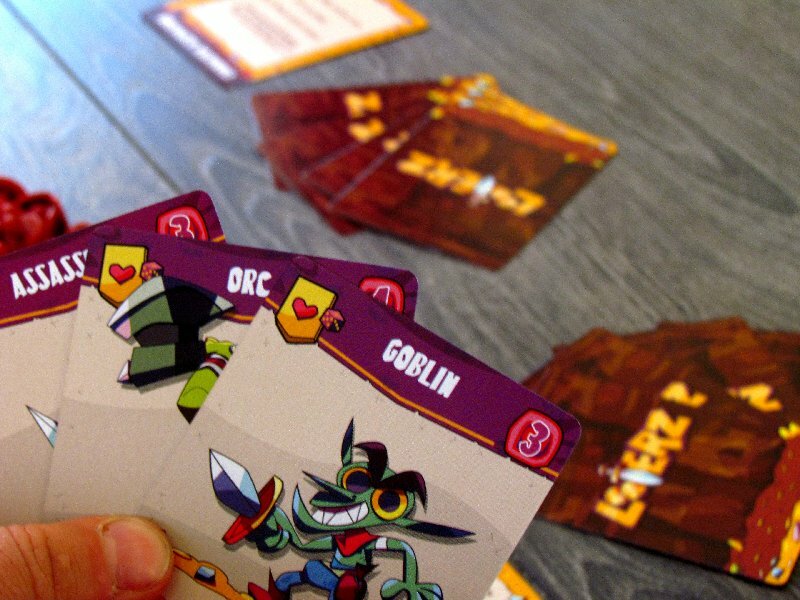 It’s actually a silly fun stylized similarly to Munchkin. 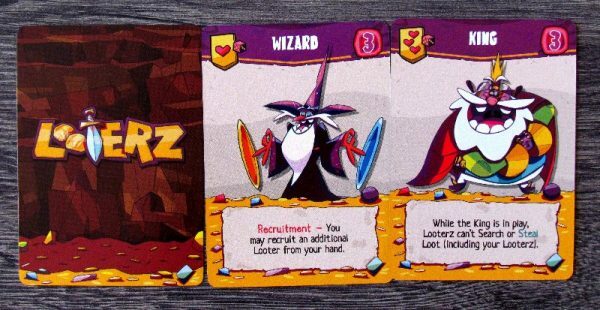 But while it reminds you of it, Looterz are significantly easier and lacks the distinctive and unique humor of already mentioned series. Luck in cards and dice needed to collect treasures is the reason, why this game is still a lot of fun. The most important element of success is not collecting gold, but an attempt to prevent rivals from doing it. Players can challenge rivals and eliminate their heroes, but they play new ones next round, making their efforts endless. 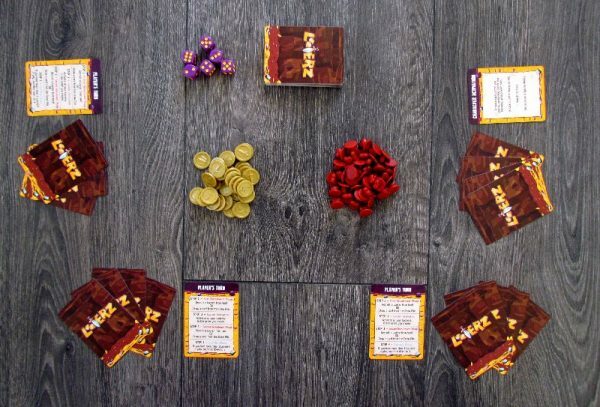 So actually, you try to kill only those strong ones, that may collect many gold with bigger chance of success against dice roll. So far we have not accented, that many characters have special abilities and they are part of this decision making too. 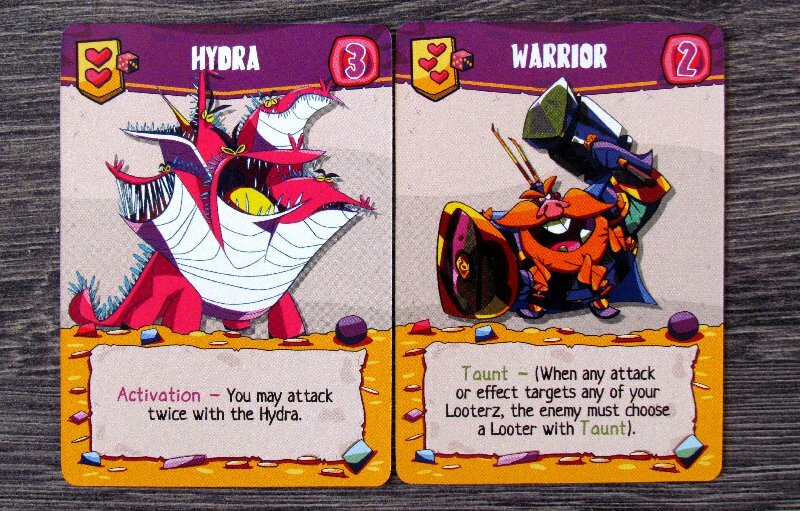 Their activation can be selected instead of treasure hunting and attacking opponent. Game is obviously very fast, its not possible otherwise with such simple games. It can be played in two, but its best with three, when things move just right, but at the same time, there are more attacks, than with two. The more the game is conflicting, the more fun it becomes, but even so, gameplay is not something to be remembered. This new game is another example, how the game can be overproduced. 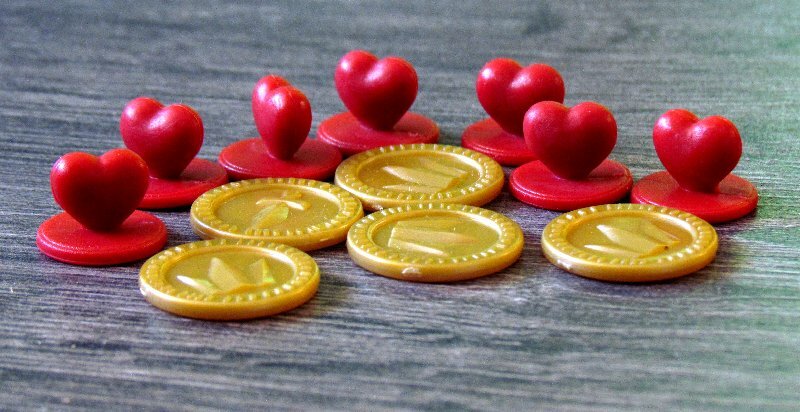 Plastic tokens of hearts and coins have really no purpose, because they can be substituted by simple cardboard. 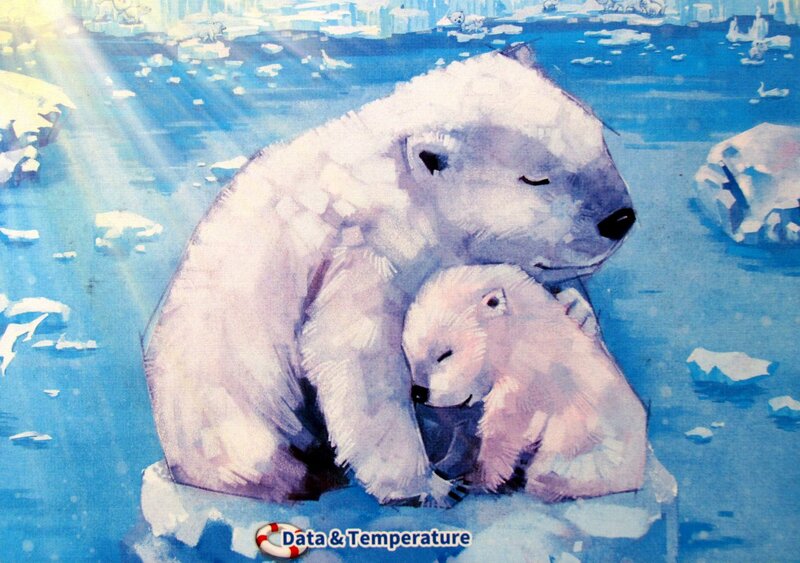 But on the other hand, it is necessary to appreciate the really nice and colorful illustrations and overall look. Looterz are ultimately a bit disappointing. 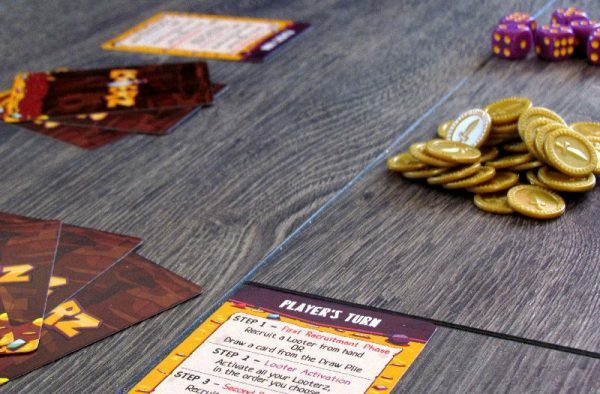 It is a lightweight casual game, that actually does not give players much opportunity to plan or improve their options. Instead, they become slaves of dice and attacking opponents is also not so important, because heroes are quickly replaceable. 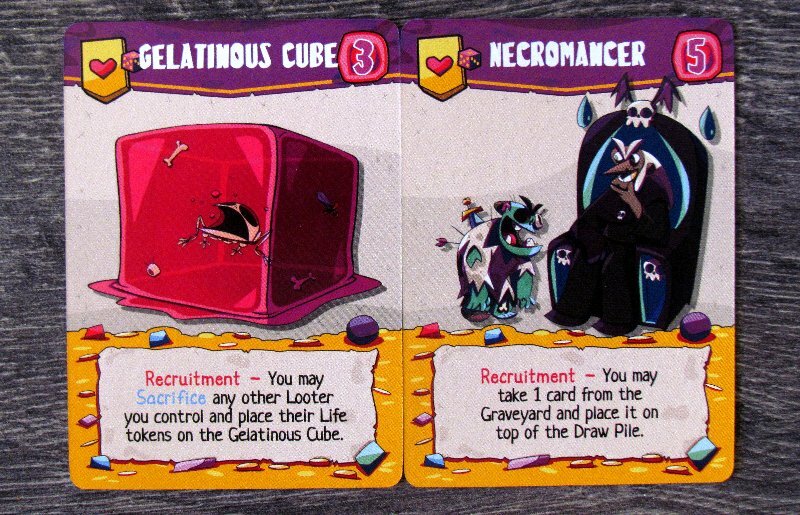 Looterz are a nice filler, but it certainly will not replace your favorite one. 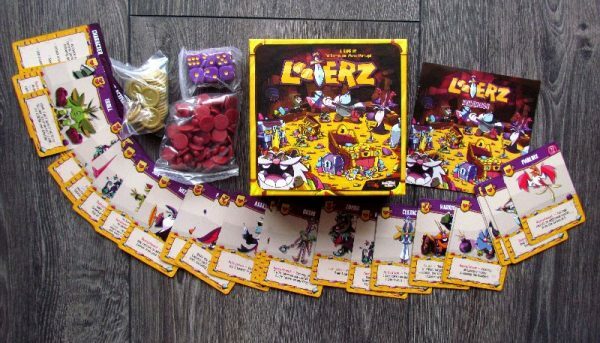 Looterz is a game, that had several prerequisites for success. Beautiful processing, humorous theme and easy gameplay. But it all clicked into each other a bit wrong, and the result is a game, that is not entirely fun from top to bottom. In addition, the efforts of the players get pretty random, so you should not wait good feeling of control here. The only saving grace is quick playing time, where everything runs fast. So if you want a conflict filler, and fantasy theme suits you, then Looterz may be your choice. Just try it out before you buy.